Unveiling Spark Plasma Sintering High-Throughput Processing (Robert Aalund). Effect of ß-Phase Percentage on the Sinterability of SHS Si3N4 Powder (Yong Jiang, Laner Wu, Youjun Lu, and Zhenkun Huang). Microwave Synthesis of Cobalt-Ferrite Nano-Particles by Polyol Method (Amal M. Ibrahim, Morsi M. Mahmoud, and M. M. Abd El-Latif). Investigation of Selective Microwave Heating by Use of Raman Spectroscopy (G. Link, M. Thumm, W. Faubel, St. Heissler, and P.G. Weidler). Simulation of Manufacturing Process of Ceramic Matrix Composites (Jeffrey S. Crompton, Kyle C. Koppenhoefer, and Sergei P. Yushanov). Novel Nontraditional High Alumina Ceramic Composite (Evelyn M. DeLiso and Karl-Heinz Schofalvi). Production of Ceramic Composite Materials of Aluminum-Silicon Dioxide-Dolomite System Using SHS Process (B. B. Khina, K. B. Podbolotov, A. A. Zgurskaya, and A. T. Volochko). Fabrication of Carbon Fiber Reinforced Ultrahigh Temperature Ceramics (UHTCs) Matrix Composite (Zhen Wang, Shaoming Dong, Le Gao, Xiangyu Zhang, Yusheng Ding, and Ping He). Effect of Particulate Volume Fraction on Mechanical Properties of Pressureless Sintered ZrB2-SiC Ultra-High Temperature Ceramic Composites (Manab Mallik, Rahul Mitra, and Kalyan Kumar Ray). Exploring New Routes for the Development of Functional Nanomaterials Using Extreme Pressure (K. Lipinska, P. Kalita, O. Hemmers, S. Sinogeikin, G. Mariotto, C. Segre, and Y. Ohki). In Situ Formation of Carbon Nanostructures in High-Temperature Ceramic-Carbon Nanocomposites (Rafael Guimaräes de Sä and William Edward Lee). Effect of Nano-SiC Addition on the Properties of Si3N4 (SHS)/SiC (Nano) Composites (Yong Jiang, Laner Wu, Qingxiang Qin, and Zhengkun Huang). Synthesis and Characterization of Iron-Sodium-Calcium-Phosphate Glasses and Glass Fibers (Ena A. Aguilar-Reyes, Carlos A. Leon-Patifio, Christian O. Ruiz-Cedefio, Showan N. Nazhat, and Robin A.L. Drew). Activation of SHS Process in Al-Si02-C System Using Metallic Powder Activating Reactants (K. B. Podbolotov). New Porosity Inducing Material for Refractory Bricks (A.Y. Badmos and S.A. Abdulkareem). Combined Supercritical Extraction and Thermal Decomposition of Binder from Green Ceramic Bodies (Brandon Abeln and Stephen J. Lombardo). Research on Firing Distortion Prediction and Correction Techniques for Ceramics Design (Kiyoshi Soejima and Kiyoshi Tomimatsu). 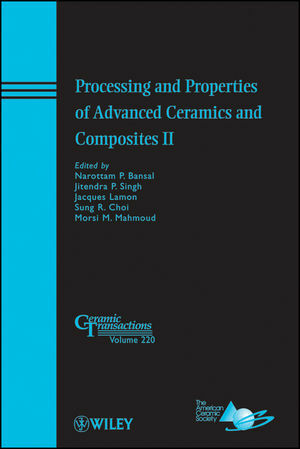 Joining and Integration Issues of Ceramic Matrix Composites for Nuclear Applications (M. Ferraris, M. Salvo, V. Casalegno, S. Rizzo, and A. Ventrella). Mechanical Properties of Hot-Pressed B4C-SiC Composites (Xiao-Lei Shi, Fu-Min Xu, Yi Tan, and Lai Wang). Mechanical Property of Boron Carbide Ceramics Prepared by Spark Plasma Reactive Sintering (S. Zhang, C. B.Wang, G. Chen, Q. Shen, L. M. Zhang). Tensile and Compressive Properties of 2D Pitch-Based and 3D Pan-Based C/C Composites in Relation to Fiber Orientation Distribution and Microstructure (Sardar S. Iqbal and Peter Filip). Foreign Object Damage in Ceramic Matrix Composites and Monolithic Silicon Nitrides (Sung R. Choi). Static-Contact and Foreign-Object Damages in an Oxide/Oxide (N720/ALUMINA) Ceramic Matrix Composite: Comparison with AN720/Aluminosilicate (David C. Faucett, Donald J. Alexander, and Sung R. Choi). Nanoscale Characterization of Polymer Precursor Derived Silicon Carbide with Atomic Force Microscopy and Nanoindentation (Arif Rahman, Suraj C. Zunjarrao, and Raman P. Singh). Measurement of Thermal Conductivity of Basic Refractories with Straight Brick Specimens by Hot Wire Method (Yoshitoshi Saito, Kinji Kanematsu, and Taijiro Matsui). Preparing and Characterizing Natural Hydroxyapatite Ceramics (Han Fenglan and Wu Laner). Intermediate Temperature Oxidation: Review and Test Method Refinement (K. Sinnamon, G. Ojard, B. Flandermeyer, and R. Miller). Structural and Thermal Study of Al203 Produced by Oxidation of Al-Powders Mixed with Corn Starch (Juliana Anggono, Soejono Tjitro, Hans H. Magawe, and Gunawan Wibisono).